All transactions are safe and secure with a reliable history in online purchasing behind each of our associates. Buy the Christmas Vacation Play Ball! 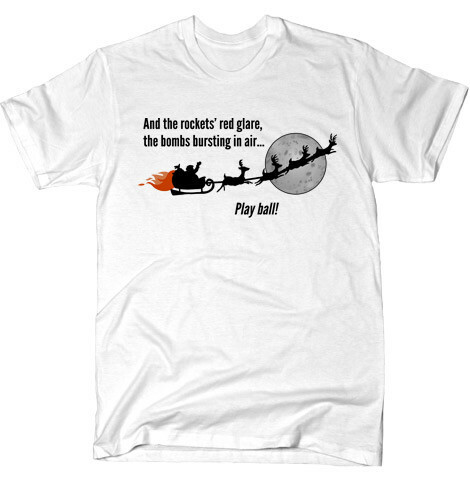 t-shirt to own Christmas Vacation clothing and merchandise. After Clark Griswold's boss Frank Shirley decides to reinstate the Christmas bonuses, all becomes right with the world. Through the window, cousin Eddie's children, Rocky and Ruby Sue, notice a red glow in the night sky that they believe is Santa Claus. In reality, it is sewer gas rising from the treatment plant as the result of Cousin Eddie. When Uncle Lewis lights his cigar, it ignites the nearby gas, causing an explosion that sends the Griswold's flaming lawn display soaring across the sky. Aunt Bethany begins to sing the national anthem and the family joins in. At the end she proclaims, "Play ball!" In addition to the Christmas Vacation Play Ball! tee above, browse the Christmas Vacation Clothing Gallery for more apparel like men's and women's clothes, kids shirts or hoodies.